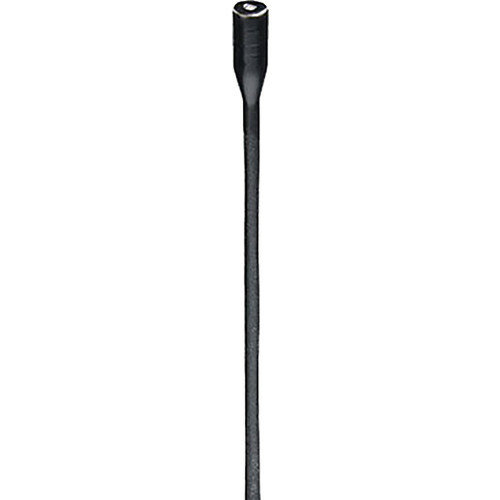 The black B6 Omnidirectional Lavalier Mic, Very Low Sens, with Detachable Hardwired 3-Pin XLR Connector from Countryman is a very small lav microphone measuring one tenth of an inch in diameter with changeable protective caps, which provide moisture resistance and color options. The mic can be used to capture audio for theater, broadcast, churches, and general lavalier applications. Looks great when you want to see it, virtually disappears when you don't. The B6 is easily hidden in hair or on costumes, or taped to a performer's face. Never suffer the hassle and degraded sound quality of under-clothing miking again. The B6 is resistant to makeup, sweat, and moisture when used with the supplied protective caps, and is well-suited to use in the hair or on the body. The protective caps are easily removed for cleaning or replacement, and the aramid-reinforced cable gives it durability. The B6 provides professional-quality audio with low distortion at SPL up to 140 dB on 48V phantom power. The aramid cable and ultra-thin diaphragm combine to deliver very low handling noise. The tiny size and natural sound pickup make the B6 easy to position for ambient noise and feedback rejection. Swappable, protective caps allow you to shape the frequency response for different situations or to match other microphones. The hardwired XLR connector allows you to interface with other preamps, amplifiers, mixers, and other equipment.